Joan Didion had always been a myth. A woman who defined California for outsiders yet she exists; this glamorous beatnik recorded the key events that went on to shape the United States. Her book of essays was published in 1979, The White Album (structured in five parts). The reader’s experience is unique; Joan Didion possesses a willingness to see others without judgment. She writes of encounters with The Doors and Janis Joplin with a cool detachment; her keen observations of ‘music people’ reveals something of their behavior. ‘Music people never wanted ordinary drinks. They wanted sake, or champagne cocktails, or tequila neat’. Is that not the description of a difficult person? Didion’s openness led to an interview with Huey Newton, she went to see the Black Panther Leader whilst he was in jail. It was perhaps one of the most fascinating aspects of The White Album, if we look at the circumstances surrounding their meeting and the writer’s approach then it becomes truly remarkable. I am telling you neither that Huey Newton killed John Frey nor that Huey Newton did not kill John Frey, for in the context of revolutionary politics Huey Newton’s guilt or innocence was irrelevant. Her unbiased position on this issue had to have raised eyebrows, after all it was 1968 and Newton was charged with killing a white police officer. Didion ponders whether Newton is uneasy about the demonstrations, did the Black Panthers see more value in a jailed Newton than a free one? She wished Newton would have said more about himself, but he did not. Perhaps that is why Didion revealed something of her own beliefs. As it happened I had always appreciated the logic of the Panther position, based as it was on the proposition that political power began at the end of the barrel of a gun (exactly what gun had even been specified, in an early memorandum from Huey P. Newton: Army .45, carbine; 12 gauge Magnum shotgun with 18” barrel, preferably the brand of High Standard; M-16; 357 Magnum pistols; P-38”), and I could appreciate as well the particular beauty in Huey Newton as issue. I wanted to know more. Didion humanised a man that history books described as a violent killer. What else did she discover? Who was Huey P. Newton? Didion characterised him as a man who refused to become a symbol, he would not become a martyr; ’In the politics of revolution everyone was expendable, but I doubted that Huey Newton’s political sophistication extended to seeing himself that way: the value of a Scottsboro case is easier to see if you are not yourself the Scottsboro boy’. Indeed she had the ability to read Newton, he fought the charges, though he was convicted, a new trial was ordered and he was eventually freed due to a hung jury. Huey Newton always maintained his innocence in the murder case. Didion embraced the principals of journalism that others have freely abandoned and withheld judgment of Newton’s guilt or innocence. I began to wonder if Didion’s openness was emblematic of the 1960s, early 70s; to look outside one’s own culture and attempt to understand someone else’s. I don’t see that often, people seem content to isolate themselves from others. But Didion was the opposite. She was intent on absorbing every detail about these strangers. Her innate curiosity feels compulsive at times, but in context it makes sense. President Kennedy was assassinated, Robert Kennedy was assassinated, and her exchanges with people who were desperate to change the world must have created the sense of urgency that occasionally appears in her essays. I, too, would want to put those memories on paper. There are some events that she can’t make sense of, such as the Charles Manson murders, she recalls the sixties ending on that day (August 9,1969). She can’t fully express the horror of the crime, but she writes of the cultural shift. It’s a striking moment, there are times when it’s clear that Didion is looking for meaning. One can’t make sense of the tragedy and it is difficult for a reader to fully capture the fear that once gripped the public. The cult leader’s murderous summer has long fascinated the public, but one look at Manson doesn’t elicit feelings of terror; my image of Manson as a frail, elderly man is in contrast to what Didion knows. I have never been to California. I always thought of it as a paradox, after all, it was the place where young actors and actresses went to become famous. There are countless stories of actors living in their cars until they got their big break that are cited by others contemplating the move. California is the state where former actors shed their former selves to become politicians; Ronald Reagan and Arnold Schwarzenegger did it, citizens in most states would have laughed but Californians voted for them. Didion’s essay ‘Good Citizen’ describes a Nancy Reagan photo-op. The scene was the picture of domesticity, reminiscent of the 1950’s, Nancy Reagan could have been in an episode of The Donna Reed Show; she was asked to pick flowers and readily complied. I had the distinct sense that we were on the track of something revelatory, the truth about Nancy Reagan at 24 frames a second, but the television newsman opted to overlook the moment’s peculiar essence. He suggested that we watch Nancy Reagan pick flowers in the garden. “That’s something you might ordinarily do, isn’t it?” he asked. “Indeed it is,” Nancy Reagan said with spirit. Nancy Reagan says almost everything with spirit, perhaps because she was once an actress and had the beginning actress’s habit of investing even the most casual lines with a good deal more dramatic emphasis than is ordinarily called for on a Tuesday morning on 45th Street in Sacramento. Reinvention is a peculiar part of life in California. A brunette becomes a California blonde, forenames and surnames are changed to sound appealing; Didion captures this subtle shift in Nancy Reagan and others. ‘Good Citizens’ encapsulates the fragmented idealism of Hollywood, actors offering a measured response filled good intentions whilst avoiding what most see as taboo. We certainly witness it now; on social media, African American actors and actresses speaking out against social injustices (i.e. Trayvon Martin, Eric Garner, Michael Brown, etc.) were criticised by many of their fans. It’s a strange dichotomy, fans want to know who their favorite actor or actress is dating, due dates for an expectant mother, they want to see wedding pictures, images of their home, and yet they don’t want them to discuss any opinions that differ from their own. The climate now is much different from Didion’s, politics occupied a smaller part in old Hollywood; there were superficial statements that were the perfect sound bites, ‘“Those who cannot remember the past are condemned to repeat it”, someone said to me at dinner not long ago, and before we had finished our fraises des bois he had advised me as well that “no man is an island”’. Hollywood maintains a comfortable distance from real world problems and perhaps it’s necessary, people lose themselves in films. There is a generation between us; everything Didion witnessed, I read in a history book. Joan Didion captures the revolutionaries, the spectacles, the openness of the 1960s-70s and challenges her readers to find the meaning. 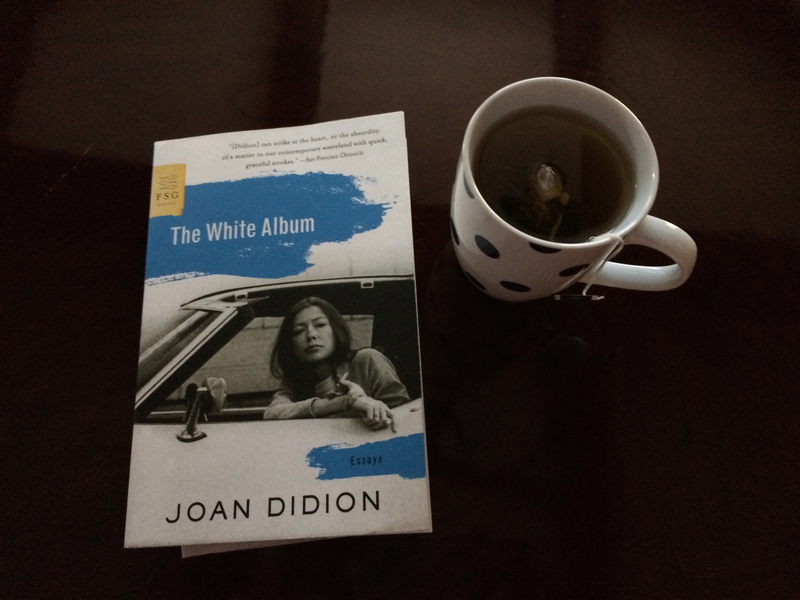 Didion skillfully weaves a patchwork of meaningful events in The White Album; 35 years later, her essays are still relevant to understanding the cultural revolution.